Yesterday, a message was left in my chatbox by Yanmie, telling me to collect a card from her blog, 'Permata Hatiku'. As usual, what comes to my mind is that the card is just a friendship card or gift that I used to receive from all my blogger friends. So, I decided to pay a visit to her blog to say hello and also to collect the card that she made and for me. A very creative card from Yanmie. Never thought that Yan will gift me this special card! 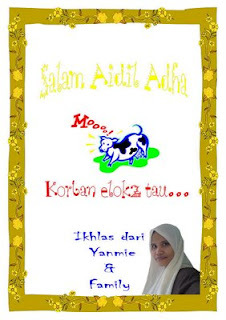 The one and only Aidiladha card from Yanmie! Thanks a lot , sis! Thanks for the thoughts! Hope we can meet eye to eye , one day! To all my blogger friends, 'Salam Aidiladha dan Selamat Menjalankan Ibadah Qurban'!